A long, thin straight shaft, typically made of metal, wood or natural materials, to be used to support and hold small chunks of meat and vegetables as they are grilled or roasted. Commonly known as shish kabobs or kebabs, the food items are pierced by the Skewer so they can be held firmly and rotated over the cooking heat. Although commercially produced Skewers are generally made of metal or wood, natural materials are also used as Skewers. The natural Skewer is used as a means to add a seasoned flavor to the foods being prepared. Examples of some of the natural Skewers include: bay branches for cooking beef and pork; cinnamon sticks for cooking chicken, pork, or fruit; lemongrass stalks for chicken, duck, pork, scallops, shrimp, and tofu; rosemary branches for chicken, lamb and shrimp; and sugarcane stalks for chicken, pork or shrimp. Seasoned or flavored wooden Skewers are also commercially produced and available in many food or specialty stores selling cooking utensils. The flavored Skewers are made to add a seasoned taste to various foods being placed on the Skewer. Since metal skewers retain the heat of the grill or fire, make sure food is never eaten directly from the metal or it may cause a severe burn if making contact with the skin. 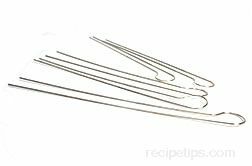 The flat metal skewers, rather than the round rod skewers, are typically better at keeping food solidly positioned so the food items can be turned without rotating on the rod. Wood skewers, most often made of bamboo, may require an aluminum foil wrapping to be placed on the areas not covered with food and exposed to the heat. This will reduce the chance of igniting the wood as the food cooks.